If you are using Mac and you are eager to files to DVD, then you should turn to a reliable application to do this. Aimersoft DVD Creator is exactly what you need. This DVD burner for Macbook Pro provides you a faster way of burning DVD on Macbook Pro and ensures you of the best results. Another great thing about choosing this software is that you can have full editing capacity for your files. In addition to basic editing functions like trimming, rotating, cropping and etc, you can do more with this fabulous tool. For example, you can apply menu to make your DVD professional looking, or adding background music to get better overall effect. The workplace is very easy-to-use. Only by a few clicks, your DVD will be finished in no time and ready to be played on DVD player. Even if you are a novice in burning DVD, you can also easily copy DVD on Macbook Pro. Now, let's follow the tutorial to learn how to burn DVD on Macbook Pro. Windows users can also have this brilliant DVD Creator, for it is fully compatible with Windows 10. The first thing you need to do is to click "+" on the upper-right corner to locate your files that need to be burned and load them to the media library. The green bar at the bottom of the interface indicates the size of your file. 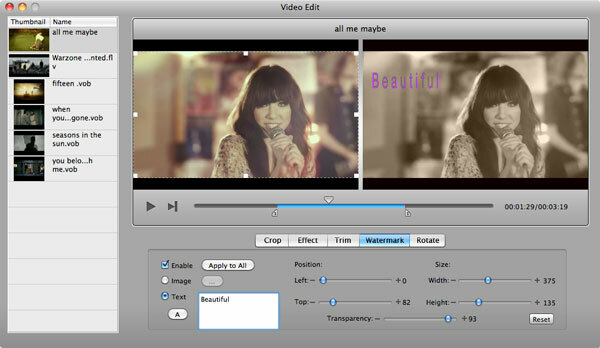 This application has a great built-in editor which allows you to touch up your video before burning. In addition to the basic editing features, you are also provided with advanced options like adding subtitles, deinterlacing, adding special effects and more. If you are going to add more fun to your movie, you can click "Menu" to apply an attractive template to the main menu and change the frame of the title page. In the preview window, you can adjust the sizes of background image, screen and text boxes, drag them to your desired position and so on. Insert a blank DVD into the disc drive of your laptop. When the computer has recognized the disc, click "Burn" button to specify the burning setting. Then wait until your DVD is finished. Generally speaking, burning a DVD may cost you minutes to hours. It depends on the size of your file. But Aimersoft DVD Creator gives you the possibility of burning DVD at a faster speed. Export iMovie to iDVD: This article shows you the easiest way to export iMovie projects to iDVD for burning. Burn DVD in Windows 8: Have no idea how to burn DVD in Windows 8? Get the detailed instruction from this article. Burn DVD for DVD Player: Want to watch your videos through a DVD player? Follow this tutorial to burn videos to DVD for DVD player. Burn DVD Mountain Lion: If you are a Mac user, you can follow this article to learn how to burn DVD on Mac OS X 10.8 Mountain Lion. Burn Aperture Slideshow to DVD: After creating amazing slideshows with Aperture, you may have the need to burn the projects to DVD. This article will show you the steps. Burn Lightroom Slideshow to DVD: Adobe Photoshop Lightroom can help you create good-looking slideshows. But how to burn the projects to DVD? Find the answer here. iPhoto Slideshow to DVD: Having created a slideshow in iPhoto and want to burn it to DVD? This articles will help you accomplish the task. Play DVD on TV: If you'd like to watch videos on TV with family and friends, you can burn your videos to DVD for play on TV. Create DVD Menu: Eye-catching DVD menu will make your DVD more attractive. Start adding customized DVD menu right now! Convert Video Cassette to DVD: Looking for the ideal solution to convert video cassette to DVD? Click here to get the answer. I am trying to burn a 3GB file as DVD-ready with your software but it's been hanging at 1% for the last 30 minutes. I'm using a trial version (in order to trial it) on a MacBook Pro 17". Any tips?